Perhaps unfairly, teenagers are often blamed for all sorts of bad things. They’re easy targets, often showing the poor judgment associated with immaturity. If you believe movies about the 1980s, if you have too many teens hanging around, it’ll result in reckless driving, shoplifting, littering, graffiti and other vandalism — and potentially worse. In reality, teens aren’t nearly so bad — but at the same time, loiterers of any time aren’t good for business. They block entrances, take up tables, make noise and rarely spend any money. So, let’s grant for a second that loiterers are a problem worth combatting; and let’s further grant that teens — who, homework aside, often have much more time than they do money — tend to loiter more than others. 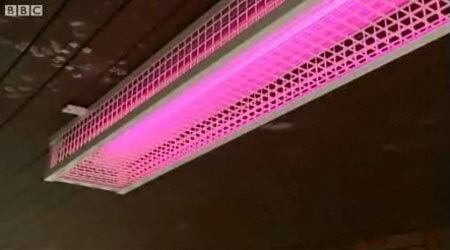 That contraption is simply a pink light in a grating. And apparently, it can help keep the mallrats away. At first, it’s likely that these communities chose the power of pink because the color is believed to have a calming effect on those who are exposed to it. (If you’ve read Now I Know More, you know that some prisons paint walls pink for this very reason.) But in this case, the lights have a different purpose. As the BBC explains, the pink lights “also show up spots on the skin.” Or, in other words, if you have acne, pink light makes it look much, much worse. And that can be used to the advantage of the shopkeepers. For example, a local official from Scunthorpe, Lincolnshire, told the Evening Standard that the town leaders “are trying to embarrass young people out of the area,” a tactic they believe in because “the pink is not seen as particularly macho among young men and apparently it highlights acne and blemishes in the skin.” And even though most teens have some sort of acne or similar, you can imagine the social discomfort that ensues when all those imperfections are highlighted by the cotton-candy colored lights above. It’s hard to say how effective the embarrassment lights are, but they’re rather inexpensive, easy to install, and hey, pink-lit streets are pretty cool anyway. As a result, a few other British localities have also taken to installing pink bulbs in high traffic areas. Bonus fact: In 1979, a group of teenagers (or maybe early 20-somethings) pulled off a prank at the University of Wisconsin-Madison which is still recalled today. The pranksters obtained more than 1,000 pink flamingos — the tacky lawn ornaments — and placed them on a prominent hill on the university campus on the day that the incoming class was to matriculate. Thirty years later, the city responded with a dose of good humor — it passed a resolution making the plastic pink flamingo the city’s official bird. From the Archives: The Case of the Missing Magenta: Name the colors of the rainbow. Where’s pink? This explains why it’s not there. Related: Pink lights for every occasion.